Xbox SmartGlass is an Xbox One controller app that turns your phone or tablet into a remote control for your Xbox One (or Xbox 360, too). This is a great way to interact with your Xbox One if you already have your phone handy while watching a movie or TV show on your console. The SmartGlass app is also useful when you're playing games, as you can use it to activate the game DVR feature on Xbox One, and many games use the Xbox 360 version to display critical second screen information like maps. In addition to controlling your console from your phone, the app also provides easy access to your Xbox friends list, achievements and gamerscore, TV listings, and more. SmartGlass is available for both phones and tablets, and it works on Android, iOS, and Windows, so pretty much everyone can take advantage of it. The procedure depicted to the left is how installing and setting up Xbox One SmartGlass works on an Android, but the process is similar regardless of the type of phone or tablet you have. Launch the Google Play Store, App Store, or Windows Phone Store, depending on your device. Search for Xbox One SmartGlass. 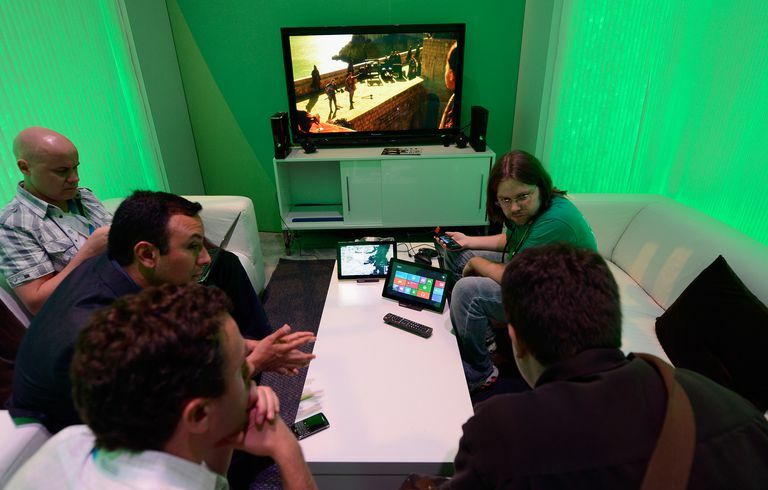 Launch the Xbox One SmartGlass app. Enter the email, phone, or Skype name associated with your Microsoft account and tap Next. If the screen displays your gamertag, tap Let's play. If it doesn't, tap Switch accounts and log into the account associated with your gamertag instead. Your device is now set up to work with SmartGlass, and you can proceed to connecting it to an Xbox One. Before you can use the SmartGlass app for anything, you have to connect it to an Xbox One. This requires the phone and the Xbox One to be connected to the same Wi-Fi network. If you aren't sure how to connect your phone to Wi-Fi, here's how to connect an Android to Wi-Fi, and how to connect an iPhone to Wi-Fi. With the Xbox One SmartGlass app open on your phone or tablet, tap the hamburger button in the upper left corner (☰). Tap XboxOne if you haven't changed the default name of the console, or tap the name you assigned if you have changed it. Your SmartGlass app is now connected to your Xbox One. While SmartGlass has a lot of different uses, one of the biggest benefits is being able to use your phone as a remote control for your Xbox. With the Xbox One SmartGlass app open on your phone or tablet, tap the remote control icon located in the bottom right corner of the screen. Tap where it says A, B, X or Y on the screen, and the console will act as if you pushed those buttons on a controller. Swipe to the left, right, up or down on your device screen, and the console will register as if you pushed that direction on the d-pad. These controls work on the dashboard and apps but not in games. Xbox One has a built-in DVR function that can record your gameplay, and you can trigger it in a bunch of different ways. If you have a Kinect, you can even activate the recording feature with your voice. With a game running on your Xbox One, tap the name of the game in your SmartGlass app. What Else Can Xbox One SmartGlass Do? The main purpose of SmartGlass is to control your console with your phone, but its utility doesn't end when you switch off the console and walk away from the couch. If you ever want to check your achievements, or your gamerscore, when away from your Xbox One, SmartGlass is hooked into that. It also has leaderboard info so you can keep tabs on your friends, and you can even send them messages if they're online. SmartGlass also gives you access to video and screen captures, the Xbox store, and OneGuide, which is a built-in TV listing feature that populates with your favorite shows if you use your console to watch television. Xbox 360 may not be Microsoft's hot new system anymore, but you can still use SmartGlass with it. The catch is that the Xbox 360 and Xbox One use different versions of the app, so if you have both consoles, you'll have to download and install two different versions. Search for Xbox 360 SmartGlass. Launch the Xbox 360 SmartGlass app. Sign in to your Microsoft account, or create one if necessary. Tap the Start button, and you're ready to go. What Can SmartGlass Xbox 360 Do? SmartGlass for Xbox 360 can turn your phone into an additional controller for a game, display information like maps when you're playing a game, and even turn your phone into a mouse to interact with apps like Internet Explorer.